Daniel Wellington watches fuse impeccable style with a relaxed and preppy sensibility, a truly British aesthetic. Founder, Filip Tysander, was inspired by a British gent he met while travelling, Daniel Wellington, who loved to wear his Rolex watches on old weathered Nato straps. He has extended his range to include chic leather straps named after iconic University cities, these designs have proved to be a huge hit with the stylish crowd. 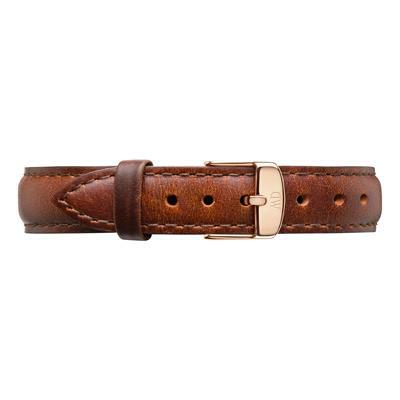 Interchangeable Daniel Wellington Ladies Classy St Mawes watch strap in brown leather, with rose gold clasp.